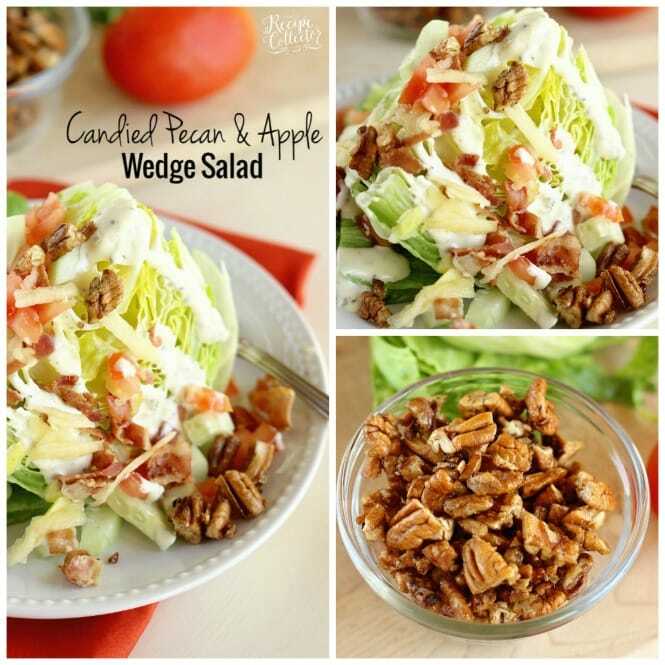 Candied Pecan & Apple Wedge Salad Recipe – An easy salad side idea with the perfect combination of sweet and salty flavors! So is it feeling more like Spring where you all live? It did for us until about 4 days ago, and now winter is sneaking up on us again! But I am so ready to move on to warm weather! When I think of Spring, I immediately become mindful that swimsuit season is just around the corner. And with that comes the feeling that I need to start eating a little better. After months of casseroles and hearty soups, I try to start incorporating more grilled proteins and veggie sides. I love a good classic salad with dinner, but every now and then, it’s fun to change things up a bit. 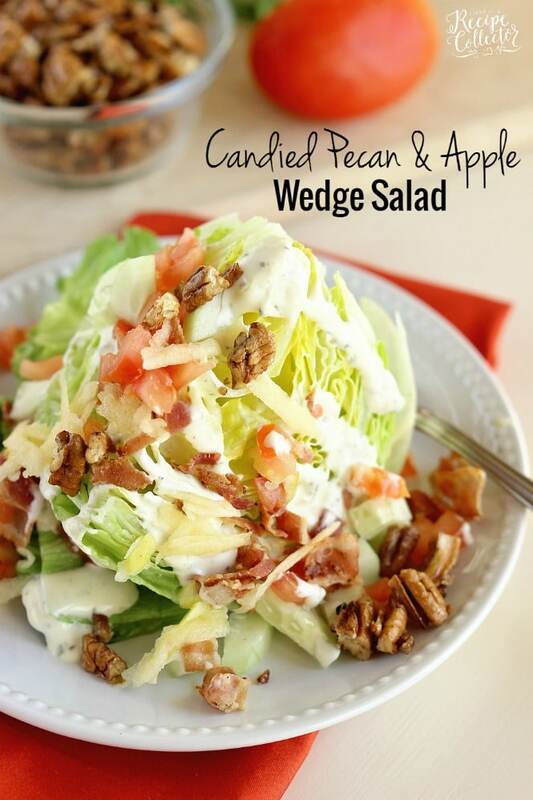 A wedge salad is just the way to do that too! They are so easy to make. They are perfect for steak night around our house! The first time I had one of these at a local restaurant, I was immediately sold on how unique they are and fun to eat. Since then, every time I see one on a menu, I like to get it. I love chopping my veggies on top really small too. It helps them to stay atop the salad better. 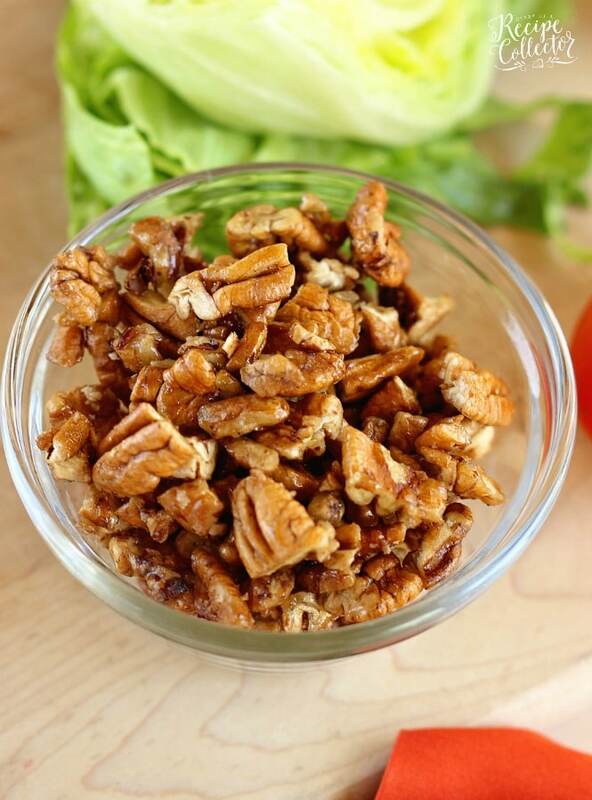 And the toppings on this Candied Pecan & Apple Wedge Salad are what make it so great!! It has that perfect combination of sweet from the candied pecans and salty from the bacon. And the apple goes perfectly with those two flavors!! I also add some finely diced cucumber, diced tomato, and my favorite ranch and call it done. It’s so easy! Plus you can add some shredded cheddar as well, which also goes gloriously with all these flavors. So next time instead of chopping everything for your salad, make it a wedge, and have some fun! 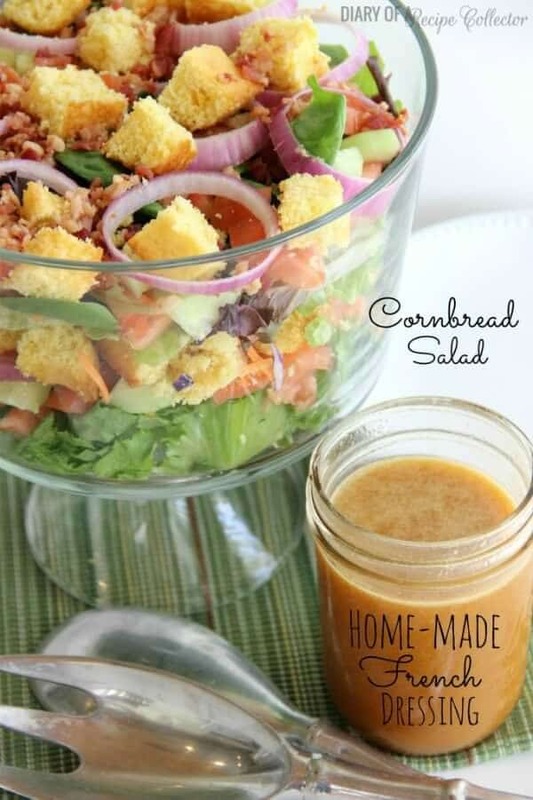 Plus be sure to check our some of my other salad sides below! 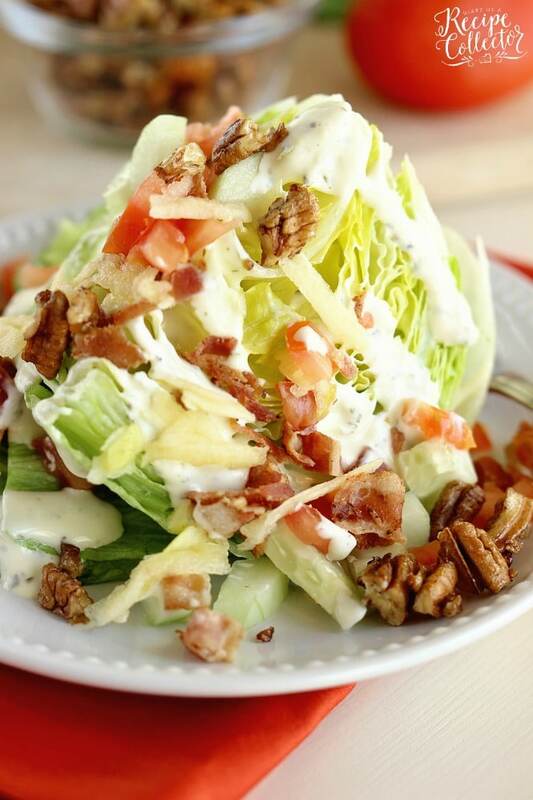 Top each wedge with ranch dressing. 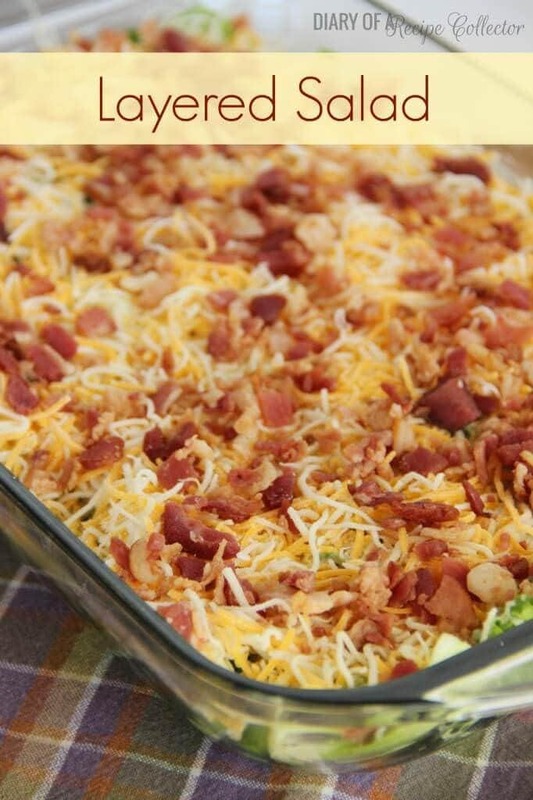 Sprinkle on bacon, tomatoes, cucumbers, shredded apple, cheese(optional), and candied pecans. Serve. In a small bowl, mix brown sugar, salt, vanilla, and water. Heat pecans in a small sauce pan over medium heat a few minutes. Remove from heat. Add sugar mixture to pecans and stir to evenly coat pecans. Pour out onto wax paper to cool and dry. Goodness! What a salad….sounds and looks good! Love apples and pecans together – this is a winner. Pinned. Thanks for sharing.